I've become convinced that some people are not finished with making amulet bags quite yet! When I asked that question a few weeks ago, it got me to thinking that I had never shared with you how I start my bags, and I really think it's a technique worth knowing. 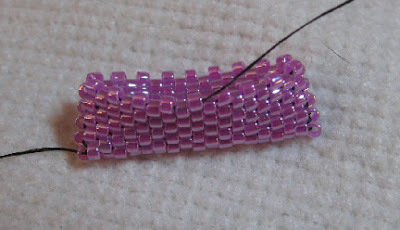 I am not a fan of stitching a flat peyote stitch piece and then zipping it up when finished. I find it too limiting, and there is absolutely no room for freedom or error. Yes, you will end up with a perfect little bag...IF you get all the counts exactly right. No, there is nothing wrong with doing it this way, but here's the method I prefer and why I prefer it. 1. 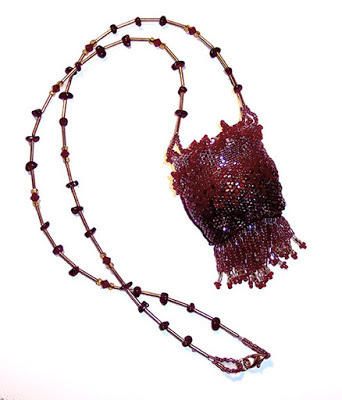 Start by picking up an odd number of beads. 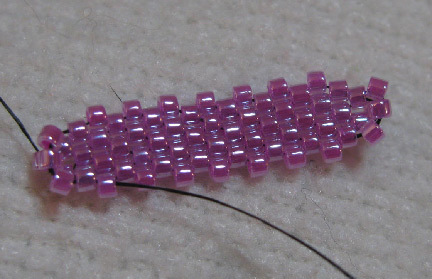 Pick up another bead and pass through the third bead from the end of the first row, pulling the last bead of the first row sideways. Stitch back towards the beginning of the first row, and when there are two beads left, pick up one more bead and stitch through the tail end of the first bead added in the first row (the last bead before the tail) and through the second, turning the first bead sideways like you did at the other end. 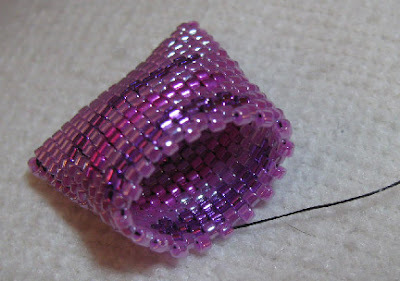 Stitching through the second bead in the turn is your step up. 2. 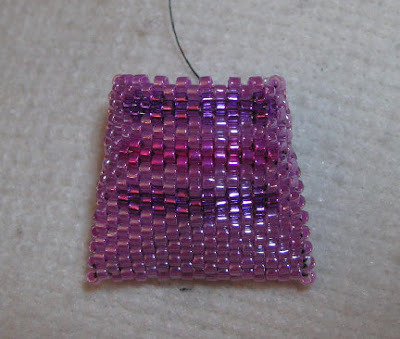 You will continue to add beads, stitching around the outside of the shape, up one side and back down the other, adding beads between each up bead. In every other row, you will have a bead that sits sideways at the end, and you will need to step up each row. 3. Now here's the great part: after you get the base established, as many rows as you want, you can switch up your beads, increase, or decrease, switch to odd count so that you can simply stitch in an upward spiraling fashion...whatever you want. No worries about zipping up later and not being able to match the sides! Very clever. This is one of those things that make people think, "Now why didn't I think of that?!" That's a pretty little bag too.